I use PHP 5.3.3, Xdebug 2.2.0-DEV and PhpStorm 2.0 (build 103.78). All this should work with Xdebug 2.1.0 as well, though. Simply click Debug and off you go. 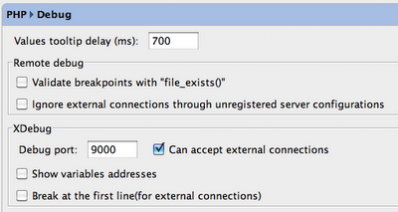 Now PhpStorm should pick up your debug request and stop at the first line or breakpoint. If you happen to have code in an excluded directory, e.g. for autogenerated things, you can step through them, but will do so blindfold, as PhpStorm does not ignore those files. I hope this post helps you with debugging, feel free to leave comments with further tips and (hopefully) success stories. I came across this post while looking for info on troubleshooting xdebug profiling. 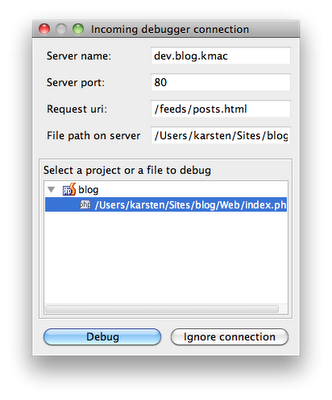 I've put up a (much more detailed) tutorial on using PhpStorm with a LAMP server and Ubuntu client myself (http://www.mysolutions.it/phpstorm-server-xdebug-configuration/), so I thought I'd link to it here as it might help future visitors with troubleshooting their setup. I will try to write one for netbeans/xdebug, I will hit you up with it..
thank you, this worked!, i've been searching all over place for this, i'm using wamp 2.1 + firefox 4 + phpstorm 2.0.1. Thanks again. Thanks for the step by step description it was really helpful. Also, if you use the Xdebug plugin (for safari or Firefox) it gets easier. You can get both at xdebug. on September 27, 2008I use Eclipse with the PHP Extensions since a couple of years now and its genittg better all the time. Did you use that before?I could imagine switching, even though I had to learn how to use that new IDE, but I wonder if there are good reasons Do you know some?